Barack Obama’s standing in the FiveThirtyEight forecast reached its strongest position to date on Tuesday as a result of favorable polls in a set of swing states. The forecast model now gives Mr. Obama a 70.8 percent chance of winning the Electoral College, up from 69.0 percent on Monday and from 65.0 percent last Tuesday. Three of the polls were conducted by Quinnipiac University in conjunction with The New York Times and CBS News. The polls gave Mr. Obama leads of 6 points in each of Ohio and Florida, and an 11-point lead in Pennsylvania. In each state, the polls are at the high end of the range of numbers produced by other polling firms. As we frequently advise, no one set of polls — no matter how reputable the pollster — should be read as gospel. Differences in the numbers from survey firm to survey firm often reflect sampling error or methodological differences rather than any fundamental change in the condition of the race. Nevertheless, Ohio and Pennsylvania polls are part of a consensus of polls showing Mr. Obama ahead in these states by varying margins. Mr. Obama has led 11 of the 13 polls in Ohio since May 1, and he has led all 11 polls conducted in Pennsylvania during this period. The Florida polls have been more equivocal: Mr. Obama has held 10 leads, versus six for Mitt Romney. Still, Florida is typically a somewhat Republican-leaning state. In an election that was truly even-money, you’d expect Mr. Romney to be leading in more of the Florida polls rather than the other way around. Ohio, for that matter, is also typically Republican-leaning relative to the rest of the country, although only by a point or two. One can debate the merits of different polling methodologies — but in Ohio, it has been a debate between polls showing Mr. Obama ahead by a narrow margin, and those showing him on top by a somewhat larger one. In another swing state poll, by the firm EPIC/MRA in Michigan, Mr. Obama held a 6-point lead. That poll was broadly consistent with our model’s prior take on Michigan, which also gave him about a 6-point lead there — although the polling firm in question had previously shown relatively good numbers for Mr. Romney, including a slim lead in a poll it conducted of the state in June. Most of the polls in these states, including the most recent set by Quinnipiac and The New York Times, were conducted among likely voters, which are generally less favorable to Democrats than those conducted among all registered voters. That makes Mr. Obama’s leads there a bit more robust. 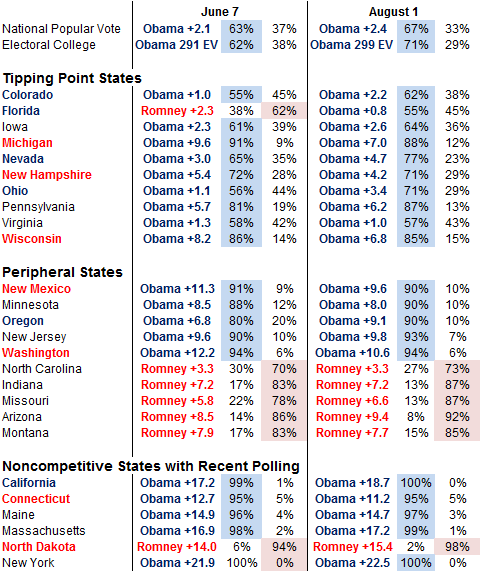 Mr. Obama’s polls in less competitive states — and in national tracking numbers — have been less strong. He received relatively weak numbers on Tuesday in polls of Arizona and Connecticut, for instance. But these states are unlikely to be decisive in the Electoral College. Our forecast model is starting to calculate a gap between the swing state polls and those elsewhere. As a result, it gives Mr. Obama a 4.6 percent chance of winning the Electoral College despite losing the national popular vote, but just a 1.2 percent chance to the same happening for Mr. Romney. Most of the advantage comes from Mr. Obama’s numbers in a few particular swing states, including Ohio and Florida. In the table below, I’ve listed a comparison between the model’s forecast in each state as of Tuesday, and that on June 7, when we debuted this year’s forecast model. The most noticeable change has been in Florida, where Mr. Obama has gone from being 2.3 points down in the forecast to 0.8 points ahead. Correspondingly, his chances of winning the state have improved to 55 percent from 38 percent, according to the forecast. In Ohio, meanwhile, Mr. Obama’s projected margin of victory has improved to 3.4 points from 1.1 points. His numbers have also improved in Nevada and, to a lesser extent, Colorado. Other swing states, including Michigan, Wisconsin and New Hampshire, have shifted slightly to Mr. Romney during this period. But these states are not quite as important to the electoral math as the ones where Mr. Obama has made gains. In Michigan and Wisconsin, Mr. Romney has improved his position somewhat — but he started from behind in those states, and most polls continue to show him behind there by a margin in the mid-single digits. New Hampshire, meanwhile, contains only four electoral votes. What accounts for Mr. Obama’s numbers in Florida and Ohio is hard to say – I personally am a bit surprised by the numbers, especially in Florida where the economy remains quite weak. Advertising spending is one potential culprit. Although advertising spending is hard to track, especially with the proliferation of “SuperPACs,” most analyses suggest that Mr. Obama’s campaign has spent more on advertising in these states in recent weeks. The effects of advertising can be ephemeral, however, which is one reason to take a longer view of the polls, and the other factors that are pertinent in the state, rather than to fixate on the most recent set of numbers. Meanwhile, it is far from clear that Mr. Obama’s campaign and his affiliated “Super PACs” can sustain an advertising advantage throughout the balance of the campaign. If so, Mr. Romney might poised to rebound in them. Nevertheless, Mr. Romney’s campaign is not working from the position of strength in these states that it might have envisioned. It’s the vote in November that counts – not the polls in August – but they represent the most conspicuous sign that incumbent presidents are hard to defeat, and that Mr. Romney has some work left to do to win the Electoral College.